A Last Will and Testament allows you to control what happens to your estate after your death. Using this Will form, you can define assets, name beneficiaries, assign guardians for your children and appoint an executor. Once you make your Will, you can easily make it legal by signing it with your witnesses. You have assets, money or property you want to be distributed to individuals or organizations after your death. You need to appoint a guardian to care for your minor children if you and the other parent cannot. You need to appoint an executor to carry out the provisions of your Will. You need to appoint a caregiver and set aside funds for caring for your companion animals. A Last Will and Testament is an important part of your estate planning. Using this printable Will form, you can ensure your assets are distributed as you wish and that your children and pets are provided for. We've even included a section for you to appoint someone to manage your online accounts and digital assets. Please note: This document is suitable for most estates. However, if you have a large estate that exceeds the current federal estate tax exemption, you'll want to connect with an estate planning attorney to help you make your Will. Writing a Will doesn't have to be difficult. In fact, you can make a Will online easily using our document interview. Our template incorporates all the legal language with your information to create a Will suitable for your state. You'll benefit from creating a list of your assets including real estate, bank accounts, investments, retirement plans or pensions, vehicles, artwork, insurance plans, jewelry, family heirlooms and more. Assets can be anything you want to leave to a person or organization. 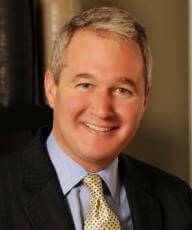 Your executor or person administering your estate oversees settling your debt. First assets go to the cost of probate and funeral expenses. Then your assets go towards paying off debt. While you may not specifically discuss debt in your Will, it should be something you keep in mind when assigning assets to beneficiaries. For example, if you leave a home with a mortgage, can the beneficiary afford the payments? Or would they have to sell the house? When you're writing your Last Will, you'll need to select your beneficiaries. Your beneficiaries are the people or organizations that will receive your property. Beneficiaries are often spouses, children, relatives, close friends or organizations such as your church or professional club. You can also put into your Will what should happen regarding the care of your pets. Your executor carries out your wishes concerning the legal and financial matters of your estate. Quite often that person is your lawyer or accountant. You can appoint more than one executor, or you can appoint a primary and a secondary. The secondary would act as the executor should something happen to the primary. You do not have to choose a professional, but you should choose someone who you think can carry out your request well and without bias. If you choose a professional, you'll want to set aside funds for their payments. If you have minor children, you and the other parent will need to decide who will care for them if you both should pass. You should discuss this responsibility with prospective guardians before you include them in the Will to ensure that they are agreeable to this obligation. How do you make your Will legal? In most states for your Will to be valid, it must be signed by you in front of witnesses. Witness signatures are also needed. All those who sign must be of legal age and mentally competent. Witnesses do not have to read your Will, they just need to see you sign it. In some states, beneficiaries are restricted from being witnesses. 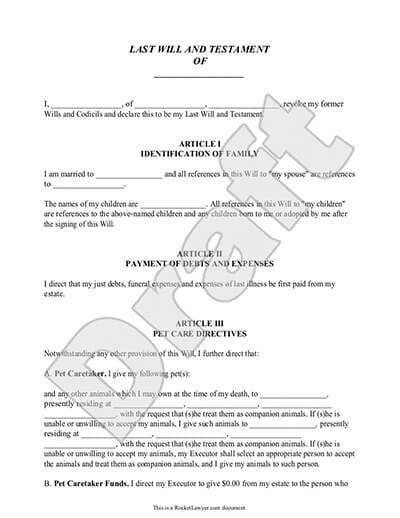 As an added layer of validation, some have the witnesses sign a notarized Affidavit stating that they saw you sign the Will. While you do not necessarily need a lawyer to make a Will legal, your state may have specific signing requirements so it may be beneficial to ask a lawyer about your state laws. Most states do not require a notary, but witnesses are required. The only exception to witnesses not being required would be if your state accepts "holographic" Wills, which are Wills entirely written by hand. You've made your Will, now what? Your Last Will and Testament is of no use if your family cannot find it or if they don't know it exists. Keep a copy of your Will in a secure location such as in a jointly-owned safe deposit box. Your lawyer should also have a copy. Let your family know you have a Will and where they can get a copy when needed. If you make changes to your Will, make sure to include those changes with the existing copies. Remember, a Last Will is part of your estate plan, not the whole thing. You may also benefit from appointing a Power of Attorney, making a Living Will or creating a Living Trust. You can learn more about these documents and more in our article, Legal Will vs. Estate Plan. It is important to review your Will regularly and especially after you make a life change or conduct a large purchase. If the amendments you need to make to your will are minor, you can add a Codicil to your will. In most cases, there is no need to redo your entire Will. However, make sure that your Will changes are kept with the original Will and that your executor knows that changes have been made. These days, you may want to leave instructions for what should happen to your digital assets. Digital assets may include information stored on hard drives, laptops or online accounts. It may also include social media, email accounts, owned domains or blogs. You can leave instructions to have accounts closed or files destroyed if desired. Make sure to leave your usernames and passwords so the person you assigned to manage your digital assets can fulfill their duties. A Last Will and Testament is just one part of your estate plan. We offer all the documents you may need for your estate planning. Visit our Estate Planning Center or our Estate Planning Guide for additional information. 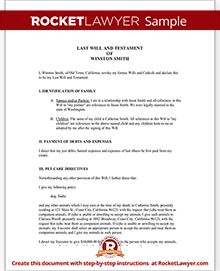 Our step-by-step interview process makes creating a printable Last Will and Testament easy.